However, bankruptcy may be the best way to regain control of your life, your finances and even your emotions. Procrastination may seem like the easiest course at times, as if you stick you head far enough in the sand things just do not seem as bad. Relief from the stress of collection calls, garnishments, repossessions or worry of the same. Stress then leads to bad decisions about money and other important areas in your life. When you are trying to juggle debts beyond your control, you will not have a reserve for emergencies that leaves you vulnerable to the inevitable unexpected events and expenses. If you settle debts outside bankruptcy it can lead to a tax bill, but no taxes are incurred by eliminating debts in bankruptcy. Often some creditors are open to settlement, but when the last ones are not it can mean the money on the first settlements is wasted. Your credit report can start healing either after you file bankruptcy, or after you pay off your debts. Minimum payments on credit cards will take decades to pay off. Just look at those boxes on your credit card statements showing how long that takes. Improve your relationships. It really is easier once you eliminate crushing debt to be nice to your spouse, children, co-workers and yourself. Being nice tends to help your relationships, really. Waiting to file until you make more money can make your bankruptcy more complicated due to a means test that only affects those making more than half the money of households their size. Retirement should be a focus regardless of your age. 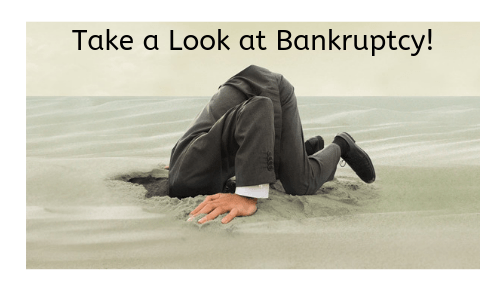 As retirement funds can be kept when filing bankruptcy, it is always too bad when I talk to folks after they have raided their retirement to fend off the inevitable. In any case, it is easier to restart your retirement savings after getting debt free. Inaction or the head in the sand trick rarely helps things. Information is power, so at the very least consider talking to a bankruptcy attorney who can explain the benefits and costs of bankruptcy. You cannot see that light at the end of the tunnel unless you hold your head up and look.